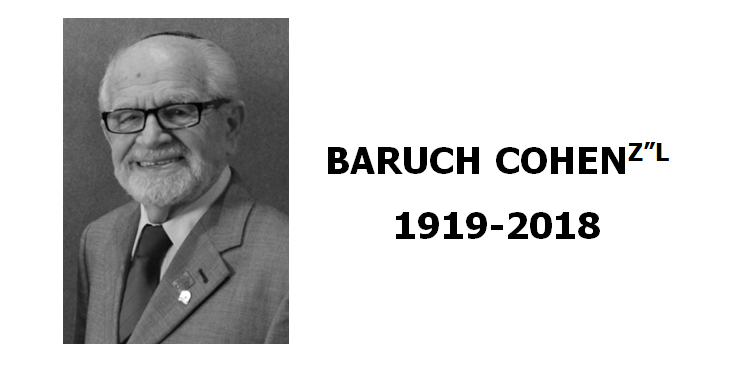 Baruch Cohen z”l passed away on September 26, 2018/17 Tishrei 5779, a few weeks before his 99th birthday. His life spanned the last hundred years of Western, and world, crises, tragedy, and triumph–born in Romania just after the end of WWI, living through first the Depression and then the rise of Hitler and of Romanian fascism, surviving World War II and the Holocaust in and around Bucharest and the Transnistrian killing-fields, and then coming under Communist rule, escaping with his dear wife Sonia and beloved daughter Monica/Malka z”l, to Israel just as the Jewish State was, miraculously, re-born. Living initially in a tent, serving in the IDF, and coming to Canada years later with his family to join Sonia’s mother and sisters there, Baruch started, once again, from scratch, rising to become a Chief Financial Officer at a major corporation, and then doing a brilliant MA in Jewish studies at Concordia University after retiring. We met as the Canadian Institute for Jewish Research was founded in 1988, and Baruch became our Research Chairman, working with me as a full-time volunteer until forced by illness to withdraw some time ago. He was a good, even saintly, person, a tsaddik, who also served for many years as a docent at the Montreal Holocaust Center, specialized in working with students, committed to witnessing to the horrors he had lived thorough in order to help ensure that they would, never again, be repeated. He had a deep love for the Jewish People, and for Israel, which he saw as positive exemplars of the potential of humanity, and he fought strongly and persistently against antisemitism and Holocaust denial in all its forms. His autobiographical memoir, which CIJR published in the fall with RVP Press, is called “No One Witnesses for the Witness”, and includes a selection of the moving, and powerful, poetry he wrote over the years. He almost single-handedly brought institutional attention to the Romanian Holocaust, the loss of some 400,000 lives which had been largely overlooked, in the literature and by Holocaust memorial institutions, but which today is recognized across the world and in recent scholarship. And the annual Romanian Holocaust Memorial, which he instituted in Montreal, will continue through the ongoing efforts of the young people he inspired through the example of his persistent and enduring witness. Baruch lived a long and difficult, and yet also a courageous, fulfilling, and useful, life, one of love and support to family, including his devoted son-in-law Lawrence Bergman and grandsons Mark and Stuart and their families, and of service to friends, the survivor community, Israel, the Jewish People, and his country and society generally. All who knew him respected, indeed loved, him, and he in turn responded with integrity, caring, and love, and especially to students and the young. He had witnessed, and survived, the greatest horrors of our time, and knew what human degradation has wrought—yet somehow he retained deep respect for what is truly human, and great hope for the future of the Jewish People and of mankind. CIJR’s 30th Anniversary, being celebrated at this year’s Annual Gala, is dedicated to Baruch: the memory and work of our great friend, and teacher, living on at CIJR and in all our hearts and minds, will remain a sustaining blessing for us all.